Red Plasti Dip Spray in a can. If you want to change the color of something on your car, or dechrome it this is the simplest way to do it. The best part is if you change your mind you can simply peel it off. 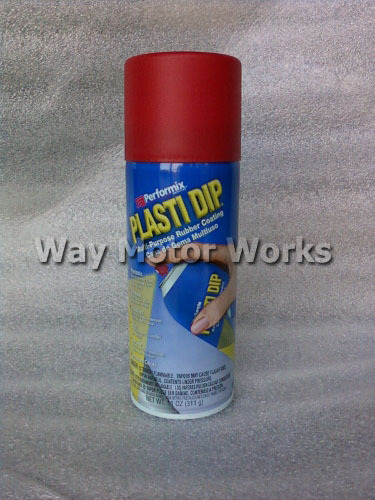 Plasti Dip is a simple spray on plastic coating. You can spray it on about anything using several coats to get it just the color you want. Plasti Dip is rated to 312 degrees, and we have seen many people use it on exhaust tips with no problem. It is really popular to use on wheels also. Plasti Dip usually is a pretty flat look to it, if you want it to be glossy we suggest using the plasti dip glossifier.